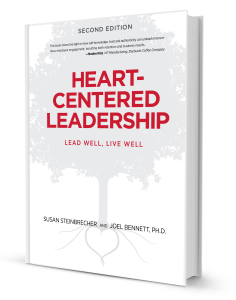 Heart Centered Leadership - Steinbrecher And Associates, Inc.
A top learning priority of an awakened organization is how to have authentic dialogue. If we listen, our hearts will tell us to think about what others need, and to consider their perspectives and how our own actions might affect them. Encouraging emotional connections between managers and employees is the key to better performance and improved employee engagement. This is the essential message that Susan Steinbrecher and Dr. Joel Bennett deliver in the book Heart-Centered Leadership: Lead Well, Live Well. In essence, heart-centered leadership is not a singular gold standard or an ultimate pinnacle that only a rare few can achieve. It lies in your ability to stop, go inward, and reflect on the course of action that you know is the right one rather than succumbing to external pressures and circumstances. Leaders can move mountains when they understand that they share the same universal needs that their associates do. People want to be valued, listened to, appreciated, respected, involved and connected. They wish to have meaning in their lives. At the very least, people want their self-esteem to be maintained and, ideally, enhanced. By embracing a heart-centered approach to leadership, you will be in a more powerful position than you could possibly have imagined. After all, what can be more powerful than motivating an associate to go the distance for you and your organization because he or she is inspired by you and respects you so highly? More importantly, you will genuinely and deeply touch the lives of others by your actions. Anyone can be a heart-centered leader if he or she has the determination and daily commitment to practice certain core principles. The root or basis of these principles is fueled by “the power of the human element.” By acknowledging and honoring the human element, heart-centered leaders possess the wisdom and capacity to positively transform any organization and run extremely successful and profitable businesses. Contact us to learn more about Heart-Centered Leadership keynote presentations, full and half-day workshops and break-out sessions. The Container Store: Heart-Centered Leadership – a Great Read!